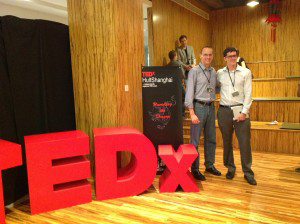 Robert Hartmann is a Swiss entrepreneur who relocated to Shanghai in 2005 after completing his high school education. He attended Fudan Univeristy to study Mandarin Chinese before completing his bachelor’s degree in Marketing at Raffles Design Institute (RDI) Shanghai, awarded by Northumbria University in the UK (where Apple’s chief designer, Jonathan Ive attended). Shanghai Bamboo Bikes began as the final undergraduate project Students were asked to collaborate with designers to simulate a company start-up. While the designers create products it was Robert’s assignment to come up with branding and marketing strategies. After much research and discovery he set his sights on the bamboo bike concept. From that point on the bamboo bike has continued to grow and change with us. 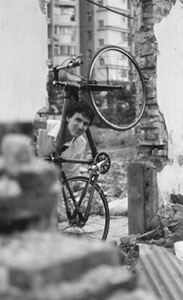 The first few bamboo bikes were non-rideable prototypes—in fact they were only intended to illustrate his thesis. Who would have known that there were so many people who wanted to buy the prototype? He quickly received orders from interested consumers and even from his own professors. Identifying the trends in demand for sustainable, practical bamboo bikes early and recognizing the business development possibilities Robert decided to invest in the opportunity and began looking for a suitable partner. In the past three years he has worked with many manufacturers and designers. Some worked better than others. Every one of them has allowed him to understand more deeply the issues one is confronted with when working with bamboo. The Middle Kingdom is home to 450 million bicycles and 4.21 million hectares of bamboo. One can argue about which bike is the ‘greenest’, but most people agree that riding any kind of bike is greener than driving a car or scooter. But riding a bamboo bicycle or trike is greener as they are made of one of the fastest growing plants on earth. The goal of Shanghai Bamboo Bikes is not necessarily to get everybody to ride a bamboo bike—it is about the joy of cycling. As long as you ride any kind of bicycle, then you are doing a good thing for your health and that of the planet. Sharing the joy of cycling and exercise with children is one of the best things you can do. On our Facebook page you can see the most recent pictures of bamboo bikes, trikes, bamboo bicycles, as well as updates on our progress. Join the community to interact with us and other friends. Today I am amazed how much has happened so far. I have learned a great deal about bamboo, bicycles and many other things. Most importantly I have realized that there is always more to learn. I work to continue improving this bicycle and develop other related products. Working with other designers has been a fantastic experience. Together we are developing the next generation bamboo bicycles. Over the years I have worked with a large number of people from all over the world on many different kinds of bamboo projects. The Shanghai Bamboo Bike project is a testament to the creativity that can happen in amelting pot like Shanghai. As I have said many times: “the new American Dream is in China”. Copyright © 2009-2011 Shanghai Bamboo Bike. All rights reserved.